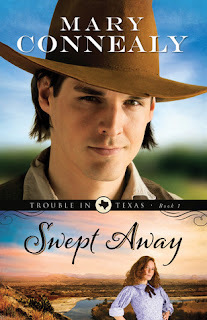 Swept Away is a western romance complete with the wild west flair of gun fights and dirty sheriffs. The fast paced action centers around Luke and Ruthy as they meet up to regain Luke's land in Texas. But the story starts out with a splash as Ruthy is tossed from a flooding river and it's Luke who rescues her. The romance immediately kindles, and the evil posse who stole Luke's ranch has no idea what hit them once little Ruthy unleashes her skills. These characters were fun to watch in action, although it was a bit of a predictable story, several of the side characters helped round out an intriguing plot line. Battered wife Glynna becomes someone that Luke and Ruthy have to save, and it turns out it is Glynna's story that we will see in the next installment in the Trouble in Texas series. What I found interesting about this Christian novel was there was not a ton of the faith element here at all, but actually a bit more of the witty remarks. So even though the situation was dire amongst gunfire and violence, the slant towards a romantic comedy was evident, making this a fun and light read, indicative of author Mary Connealy.